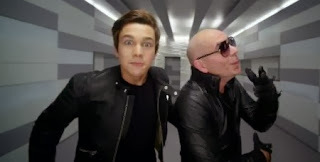 After releasing behind the scenes footage for his new single, singer Austin Mahone released the music video for "Mmm Yeah" featuring Pitbull. Directed by Gil Green, the video shows the Texan rapper and using an all-black wardrobe full of lights on a white setting. The song follows the success of "What About Love" and "Banga Banga", and includes on the debut album of the musician.